The Inside Higher Ed article, Are Colleges Pushing Students to Do Too Much in High School?, hit me very hard. I hear this complaint too often for anyone’s good. As both an ex-homeschooling mom and homeschool/college counselor, I cringe when friends tell me that their kids are sleeping four hours a day, rushing to finish homework or cram for their five AP exams just because everyone else is doing it too. The article confirms how widespread an issue this has become. Worry is a parent’s middle name. There is so much pressure to do things right with parenting teens. You are not alone if you think you struggle all the time. On the one hand we want our kids to have a bright future and on the other we want them to have a childhood and a ten-hour bedtime. We equate a place in a selective college with a bright future. We equate time spent reading for pleasure, watching TV, daydreaming, and sleeping in late with idleness although deep down we know that this is all part of the childhood we want them to have. Enough articles have been published about depressed, anxious, sleep-deprived kids. Enough documentaries. Enough blog posts about teen suicide due to high pressure academics. Enough. Just enough. When and at what point will this stop? If you have to kick up a fuss in your family or within a homeschool community to help freeze the rat race, do it. This is not a post about how homeschooling will rescue all teens. Homeschooling might but it only will if parents believe it can. Homeschoolers can be as guilty of overloading their days as families who choose brick and mortar high schools. We homeschoolers are not immune to the whole “take the most rigorous schedule you can” nonsense. In fact, I belong to several support forums where along with advice to take it easy and to scaffold as much as possible for maturing teen frontal lobes, parents are still feeling pressured to choose the most difficult math curriculum and the most challenging lab sciences or most output-heavy humanities classes all at the same time. To what end? Some kids need to be busy and thrive on taking 7 college-level classes a year while acing math competitions, having rigorous dance schedules, writing multiple award-winning short stories, and helping their parents run their farm all while feeding the hungry at every soup kitchen opportunity. Otherwise, these kids wilt. This is not hyperbole. This is how these kids are wired. As consultants heavily involved in gifted and 2E communities, we come across these kids quite often. Not many realize that these kids are giving up something else in order to live life on their terms. Often, they are willingly giving up sports or robotics or spending time with friends because to them the latter are not as quality experiences as academics and farming or feeding the poor. Their parents hang on for dear life, monitoring closely and often putting their feet down to cut back on activities when they think it’s too much. These are choices these teens are making to keep their inner happiness aglow. For these kids, boredom is anathema. Boredom means not having something incredibly rigorous to do. And to them their chosen activities do not feel like rigor. They choose these activities for leisure! They cannot be happy without these choices in their lives. 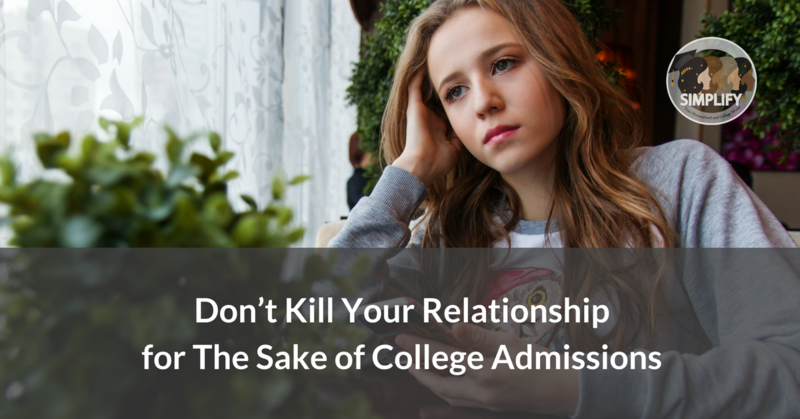 Read this twice if you have to…not every teen who chooses to lead a busy life wants to be in a selective college. Some attend their much more affordable lower-tier but comfortably familiar state schools. Some take gap years (yes, years) to continue doing what they love without a four-year graduation deadline. Some start businesses. Some take time to heal from sudden illnesses. Some want to try time away from home but not in college. These are not the teens who decide to check out of their lives with a bottle of pills or worse. The ones who do check out are the teens who do not feel at home with the decisions they have made or have had made for them. I am not a doomsayer but I won’t apologize for being frustrated with elite colleges for not helping end the madness. Many, many kids don’t need to be busy all the time. So many studies have shown that leisure brings healthful benefits to teens and that free time frees the brain to actually think better. How often do you catch your teen staring into space without a screen or textbook in hand? Have you considered that it’s something they need to do? This is the brain’s natural response to needing a break. Nurture it. Want to homeschool the teen in front of you? Look carefully. Who is your kid really? If you are homeschooling and are worried about college admissions, giving your child time to truly be themselves is number one priority. Achievement is not the 30+ high school credits and perfect SAT and ACT scores and GPA that all well-meaning relatives nudge teens to aim for. Achievement is in being authentic in their experiences. If they are not genuinely excited about the things they do, no amount of essay coaching advice can help them craft stand-out personal stories to admission committees. My own personal homeschool strategy was to help my teen plan all that was desired for each semester and then to encourage this child to slash one or two classes/activities from the list. If my teen signed up for two very challenging high school courses, I would recommend two or three easier ones to balance the load. There were many semesters when my teen dropped or shoved classes aside due to heavy workload. We were careful to take note of dual enrollment drop dates ahead of time to avoid a W on the transcript or a fee penalty. When it was time to apply to colleges, we made realistic choices based on both finances and student community fit, not just brand name, potential, and the carrot of “future” success. We had a good number of safeties to fall back on, schools that I knew my teen would be happy with if the first two choices said no. And we constantly told ourselves there was always a Plan B: such as a gap year spent learning something very different or becoming a math tutor first to gain more exposure towards a future career in academia. My teen chose to be a math major from the age of 12, but vehemently refused to participate in math competitions. General wisdom screamed, “Not a mathlete? Kiss every selective math department goodbye.” Thankfully, my teen stuck to their decision and I let it go or we would not be enjoying the peaceful bond that we do. There was no point in forcing competitions if it was not enjoyable. A kid who doesn’t enjoy their activities will eventually burn out. If they burn out immediately and you catch it in time, that’s actually good news. I live in the SF Bay Area. I did not want the kid burning out at age 18, train schedule in hand. Homeschooling the teen in front of you means letting go of comparison. We compare everything. We see beautiful home decor on Pinterest and want our homes to look the same thinking that everything on Pinterest is real. By wanting kids to succeed in college placement terms, we are comparing them, even if we don’t realize it, to other kids who are accepted to elite colleges. Everyone is giving something up by wanting the things they genuinely do. You can make the choice NOW that what your family is giving up is not your teen’s happiness or the close bond you wish to enjoy for years to come. Visit Simplify’s free Resources page for a realistic Grade 8-12 roadmap that respects the needs of your teen when homeschooling high school.